All pool events are timed and the fastest time wins. Record times exist for British, European and World categories – as well as all important athlete PB times. With a dive entry, the competitor swims the course passing under the immersed obstacles to touch the finish wall of the pool. With a dive entry, the first competitor swims passing under immersed obstacles. After the first competitor touches the turn wall the second, third, and fourth competitors repeat the procedure in turn. With a dive start, the competitor swims 25 m freestyle and then dives to recover a submerged manikin to the surface within 5 m of the pick-up line. 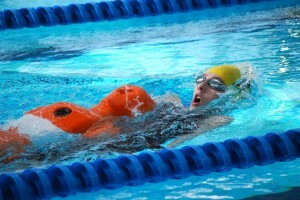 The competitor then carries the manikin to touch the finish wall of the pool. With a dive start, the competitor swims 50 m freestyle wearing fins and then recovers a submerged manikin to the surface within 10m of the turn wall. The competitor carries the manikin to touch the finish wall of the pool. With a dive start, competitors swims 50 m freestyle with fins and rescue tube. After touching the turn wall, and within the 5 m pick-up zone, the competitor fixes the rescue tube correctly around a manikin and tows it to the finish. The event is complete when the competitor touches the finish wall of the pool. With a dive start, the competitors swims 50 m freestyle to turn, dive, and swim underwater to a submerged manikin located at 17.5 m from the turn wall. The competitor surfaces the manikin within the 5 m pick-up line, and then carries it the remaining distance to touch the finish wall. Competitors may breathe during the turn, but not after their feet leave the turn wall until they surface with the manikin. With a dive start on an acoustic signal, the competitor swims 75 m freestyle and then dives to recover a submerged manikin. The competitor surfaces the manikin within the 5 m pick-up zone and carries it to the turn wall. After touching the wall the competitor releases the manikin. In the water, the competitor dons fins and rescue tube and swims 50 m freestyle. After touching the wall, and within the 5 m pick-up zone, the competitor fixes the rescue tube correctly around a manikin and tows it to the finish. The event is complete when the competitor touches the finish wall of the pool. One competitor throws a weighted line to a fellow team member located in the water on the near side of a rigid crossbar located 12 m distant. The competitor pulls this “victim” back to the finish wall of the pool. With a dive start on an acoustic signal, the first competitor swims 50 m freestyle without fins. With a dive start after the first competitor touches the wall, the second competitor swims 50 m freestyle with fins. With a dive start after the second competitor touches the wall, the third competitor swims 50 m freestyle towing a rescue tube. The third competitor touches the turn wall. The fourth competitor, in the water wearing fins with at least one hand on the turn wall, dons the harness. The third competitor, playing the role of “victim”, holds the rescue tube with both hands while being towed 50 m by the fourth competitor to the finish. The Simulated Emergency Response Competition tests the initiative, judgement, knowledge, and abilities of four lifesavers who, acting as a team – under the direction of a team leader – apply lifesaving skills in a simulated emergency situation unknown to them prior to the start. This competition is judged within a two-minute time limit.